JumpStart is APCOM’s flagship capacity strengthening programme for community organisations. The initiative aims to improve, and build on an organisation’s existing management and advocacy, while encouraging leadership for a community-led HIV response. Commenced in 2013 as a partnership between APCOM and Australian Federation of AIDS Organisations (AFAO) under the funding from the Australian Aid, JumpStart has now been applied to a total of sixteen MSM and transgender country and regional networks and organisations. 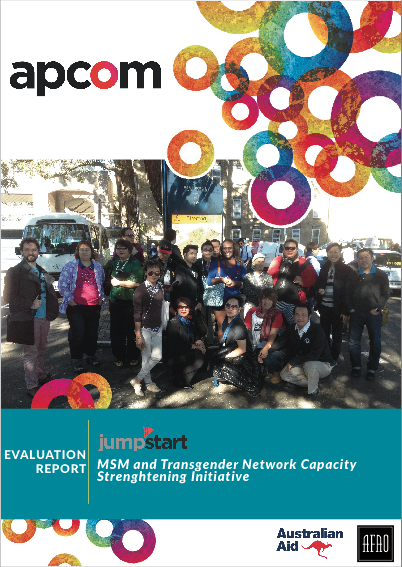 Having implemented these assessments, APCOM launches a report to evaluate the programme – Evaluation Report: Jumpstart (MSM and Transgender Network Capacity Strengthening Initiative). The Evaluation Report is a result of the programme’s appraisal from the assessed regional partners (Greater Mekong, Insular South-east Asia and the Pacific) as well as the country partners in ten countries, including Cambodia, Lao PDR, Myanmar, Thailand, Vietnam, Malaysia, Indonesia, Philippines, Tonga and Fiji. “Jumpstart has significantly contributed to strengthening APCOM’s own capacity to strategically engage in policy advocacy both locally and regionally, while also building our competency to build the capacity of our community network members in this area”, notedMidnight Poonakesetwatta, Executive Director of APCOM. The JumpStart partners from Tonga (Pacific) and Vietnam (Mekong Sub-Region) presented achievements and lessons learned from the country implementation of JumpStart project during a session at the Global Village and Youth Program of AIDS 2014 Conference. JumpStart is a strategic and logical initiative considering the HIV context in Asia and the Pacific, the needs of MSM and transgender organisations and the stage in development of APCOM. The initiative is a timely and appropriate intervention, which is based on clear rationale and strong needs. If evaluated as a pilot project, JumpStart performed well and made strong progress towards its stated goal and objectives, with concrete results at regional, sub-regional and country levels. A key strength of JumpStart was its systematic approach to capacity building, which is based on a well-conceived package of support that combined high quality strategic information, tried and tested tools, and peer support/mentoring, and a straightforward project management. Jumpstart’s another strength is its peer-based and partnership approach utilising strong inter-personal communications. JumpStart enabled APCOM to build expertise in technical support provision and advocacy, learn the needs and dynamics of its constituency in greater detail, strengthen its relationships with direct project partners, and build its credibility and profile among civil society in Asia and the Pacific. There remains a large and growing need for JumpStart. 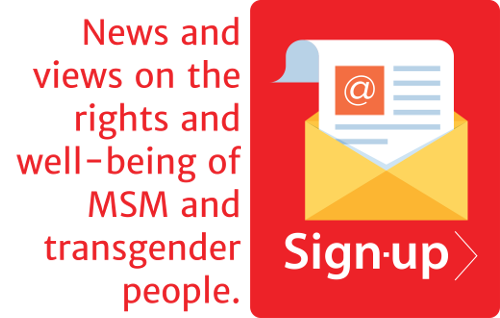 However, it will be important to focus on how best to achieve impact and support sustainability among MSM and transgender organisations and networks. Australian Awards Fellowship (AAF) Fellows during the AIDS 2014. The AAF is an Australia Department of Foreign Affairs and Trade (DFAT)-funded scholarship program where participants are trained in advocacy, policy and research. JumpStart project has sent 15 participants to AAF last 2014.